The Sonic Impact i-Fusion | OhGizmo! It’s not the first time we talk about a product from Sonic Impact. Last time it was the T-Amp, a $30 amp that allegedly did the same job as models 100 times that price. Now, we bring you something substantially less exciting, though still somewhat nifty. iPod haters out there, just skip this post. 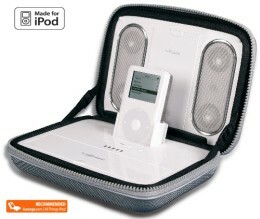 The i-Fusion is a set of docking speakers for any model iPod that happens to have its own carrying case. The case is hard, so apparently, it helps with acoustics. The speakers are powered by a rechargeable lithium battery and it comes with an AC adaptor. There is also storage room for the player, so you’ve got yourself a nice, self-contained music kit. It’ll set you back $150, right here. Story VIA Mobilewhack.